The Conditional Fields app enables administrators to hide and show fields in tickets to give agents and end-users a better user experience. 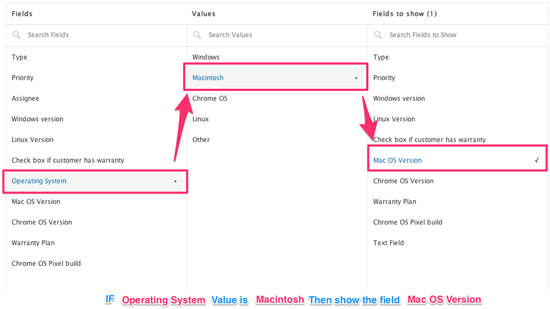 For example, if your ticket has a custom field that asks users to select an operating system, you can have two additional, hidden conditional fields—one listing the latest Mac OS X versions and the other listing the latest Windows versions. If the user selects Windows as their OS, the field listing the Windows versions is shown. The field listing the OS X versions remains hidden. The Conditional Fields app is available as a Professional Add-on (as part of the Productivity Pack Add-on) and on Enterprise. Administrators can create and manage conditional fields for regular tickets or ticket forms (see Creating ticket forms to support multiple request types (Enterprise)). Note: Multi-select fields are not supported for use with the Conditional Fields app. They can be hidden by the app as a result of other field conditions which can cause an error to appear when exiting out of tickets. For more information about this issue, see this support tip. Note: Position customization is only available on the Desktop version of Zendesk Support. It is not adjustable on the mobile version. Administrators can install the app, and configure it to apply to agents in certain roles. Click the Admin icon ( ) in the sidebar then select Apps > Marketplace. Click the Conditional Fields application icon. On the app details page, click the Install App button on the upper-right side of the page. Title: Required. Enter a title or accept the default title. Remove conflict prevention warnings: Optional. Select this if you don't want to receive conflict warnings. Enable role restrictions: Optional. Select this to restrict access to this app to certain roles. When you select this option you can then choose the roles that you want to have access. Note: Role restrictions are typically not recommended for the Conditional fields app. If a role is restricted from the app, agents within that role will not see your configured conditions applied to ticket fields. They will simply see all fields on the ticket form. Administration for the conditional fields app is already locked down to the Admin role, so there is no need to worry about non-admin agents editing the configuration. Agents can use the agent interface in Zendesk to create or update tickets. Administrators can make fields in the agent interface appear only when the agent selects a certain value in another field. Note: If you are editing or removing ticket fields in the Conditional Fields app, check out the support tip Conditional Fields app: What you need to know BEFORE you edit or remove ticket fields, and avoid some common pitfalls. Make sure Agent is selected in the upper-right corner. Click the Conditional Fields icon ( ) in the left sidebar. If you're using ticket forms, select the ticket form you want to work on. In the Fields column, select the form field that will control whether or not the conditional field is shown. For example, when a user selects a specific value in the control field, the conditional field will be shown. In the Values column, select the value in the control field that the user must choose before the conditional field is shown. In the Fields to Show column, select the conditional field to show. This field will be hidden by default. It'll only be shown when the user selects the specified value in the control field. Repeat the steps above to make other fields conditional. Note: You can only use each field once. You can't reuse a field you've already set conditions for. You can check your existing conditions in the left sidebar. End-users can use the web form in the Help Center to submit support requests. If you have Guide Professional or Enterprise, you can make fields in the web form appear only when the end-user selects a certain value in another field. Note: If an account is using the legacy mobile layout, conditional fields do not work on mobile devices. However. if the account uses the Copenhagen theme, or has not enabled the mobile layout, conditional fields work regardless of the device. Select End-user in the upper-left corner of the screen. Make your fields conditional as described in Making fields conditional in the agent interface above. Click the Save and generate rules for the Help Center button in the left sidebar. The app generates the code to insert in the HTML of your Help Center. Copy all the generated code into your computer's Clipboard or in a text file. You must have Guide Professional or Enterprise to edit your Help Center theme. In the code editor, paste the code you generated above. You might want certain fields to be required, but still to only appear if they meet the conditions configured in your Conditional Fields app. To do so, you can set fields to required from within the Conditional Fields app. You cannot use the required fields feature of the Conditional fields app for fields that are already marked as required in Zendesk. If you want to use the required feature of the Conditional Fields app, make sure your ticket fields aren't already marked as required for the same group (agents or end-users) from the Admin menu. Note: If a field is marked as required from Admin ( ) > Manage > Ticket Fields instead of from the app, and the field is not shown because it doesn't meet the conditions of the app, agents won't be able to solve the ticket. They can continue to make updates, but they cannot solve the ticket while a required field is hidden. If a field is marked as required within the Conditional Fields app, and the app displays the field on a ticket, then agents won't be able to submit any update until they fill in the field. The Submit button will be grayed-out and unavailable until the required fields from the app are filled in. Configure conditions as described in Making fields conditional in the agent interface or Making fields conditional in the web form for end-users (Guide Professional and Enterprise) above. 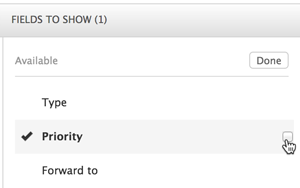 In the Fields to show column, click Required in the top right. Check the box that appears next to the selected field. I'm experience something unpleasing when using the conditional fields. When a conditional field is being hide by changing the value of the control field (or by switching a ticket form), the value of this conditional field becomes empty. I looked into this, and this is expected behavior. If you've populated a series of conditional fields, but then change one of the preceding conditions, the information in the subsequent fields will be removed. Can you tell me more about what you're working on, and why this is a problem? I understand that this behavior is expected in most cased. In this case this behavior is not what I wanted. Sjoerd, the behaviour may not be what you want but is unfortunately how that specific app operates. You can alter this if you have the skills as most Zendesk created apps reside on Github - you could fork your own version and install this as a private app. Alternatively, the Conditional field app from Cloudset appears to work the way that you want (although I did not test it exhaustedly) but I appreciate is a charged for app. Understood that cloudset provides app to hide fields for some user groups. I actually would like to use Conditional fields in order to show/hide some fields at the demand of my agent. I would like to do this because I'll have a lot of fields to fill, and that would be better for my backoffice to allow agent to focus step by step on some specific fields. When an agent hides a field, I need to keep tags instead of deleted them. Is there any apps that allows that? Cloudset have many apps, not just ones to hide fields. They have their own conditional fields app. In your case either the Cloudset app or the ZendeskLabs app will work although be aware of the issue that Sjoerd raises above. Thanks! Which app from Zendesk Lab are you talking about? Can I use Conditional Fields in a Multibrand Instance? Hey Sjoerd! Sorry about that, I've been a bit backed up over here. :) I see that Colin was able to answer your question accurately; although the behavior may not be desired, app is working correctly. Please let me know if you have any other questions! Thank you both. It's all clear, except from this: The Conditional Field-app of ZD isn't a ZD-labs app is it? Sjoerd, I think it started life in Zendesklabs but you are right, it now appears to be a fully supported Zendesk app and I can no longer find it on Github. Perhaps it was never there? Sorry for the confusion and this does mean therefore that you cannot modify it yourself which is a disappointment also. Just to be clear, the marketplace has two Conditional Fields apps. 1) https://www.zendesk.com/apps/conditional-fields/ is a free app developed by Zendesk and is only available to Enterprise customers. 2) https://www.zendesk.com/apps/conditional-fields-plus/ is a paid for app developed by Coherence Design as part of their CloudSET range. I have used the Cloudset one in a multibrand environment but have not tested it with Brand as a conditional field, sorry. CloudSET's Conditional fields, can be driven, not only by other custom fields, but also by the following system fields: Status, Priority, Type, Group, Orgnaization, and Ticket Forms. However, we are still to provide direct support for Brands, but this is on the roadmap. We can also support the use of multiple selectors i.e. you can use more than one selection method to show the visibility on a custom field. Also, changes made with our supplied configuration tool will automatically be applied to both the agent interface and the Help Center. 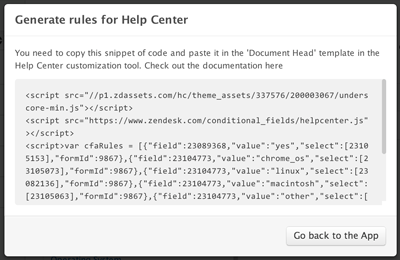 The Zendesk Conditional Fields (Enterprise) requires copy/paste configuration changes to the Help Center code. 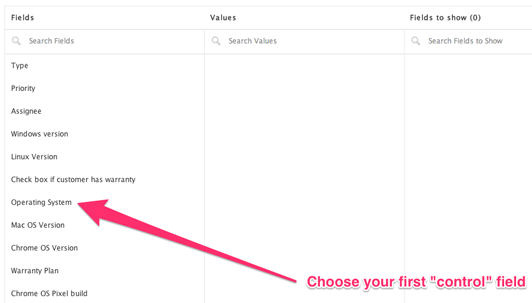 You can definitely use conditional fields in your multi-brand instances. Is there something in particular you're looking to do? That's good to know! I'm looking into the possibility of pulling in another instance into my multiband as a new brand(s). I'm going to be setting up a discovery with my account rep to get into more detail, but this is great news! I've just tested using groups with conditional fields and it worked for me. I'll create a ticket for you so we can investigate this in more detail. See you there. You're not missing anything! At the moment, the brand field is not available for use in the conditional fields app. I've sent your feedback over to our Apps team to take into consideration for the future. If this feature is critical for you at this time, you might be able to use one of the apps in the marketplace by Lovely Views or Cloudset. Setting a field as "required" under "ticket fields" makes it so that the "Field cannot be blank when an agent solves a ticket." It seems as though making conditional fields "required" in the app, however, forces the agent to fill them all in before they are able to change the status at all (not just when solving), which is problematic for us since we have fields that may require further communication with the customer before they are able to be filled in (asking for computer specs, etc.). Are there any plans to have the "required" functionality in the conditional fields apps mirror that in under "ticket fields" (ie. require upon solving)? I also need the "reuquired" functionality to behave as Amie describes above. Any way to achieve this? Will it be added in the future, or is it possible to create a fork of this app and add this functionality ourselves? I just got a little heart attack and I always have one when I try to update my conditional fields. For example, today I have added a new form that will be use. It's the same one for agents and end users. I create all the rules on the "Agent", but then afterwards how do I copy this rules for the "end user"??? There is no easy way to do this!! I always have to go to the "end user" option and delete all the conditional fields for ALL my forms!!! Then afterwards go back to "agent" option and then go back to "end user" and click on "copy rules from agent". This is something that I don't get it, why I need to erase completely all my forms in order to copy an update on my forms?? 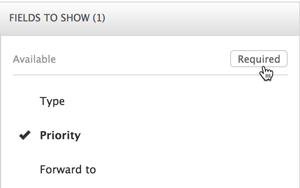 Just add an option on the end user view to be capable on "copy rules from Agent" on all the new activated forms. Much easier, less little heart attacks. Can we add a "not null" or not empty option for text fields? Hi Jerome, currently it is not possible to use the conditional fields app with text fields. Yes, I'm aware of the current limitation. I would like to see it work in such a way as I described above. I think it would be relatively easy to add a null check. How come placing a preexisting field in a conditional field tree erases all previous values of that field? That seems more like a bug than a feature. Hi Alexis, I'm not certain I understand what you're asking. I am creating a ticket to discuss this with you directly and can report back to this article when I'm more clear on your meaning. Hey ! Thanks for this great app. Is it possible for a dropdown field to be a conditionnal field, or is it only possible for text fields ? All of the fields you use with the Conditional Field App are drop downs; it doesn't work with free text fields. Please let me know if I'm not understanding your question correctly! Hello, we installed the App about one month ago. Now we see that old closed tickets (example closed in Dec 2015) are without some ticket fields and the relating information. Does the app change tickets which are already closed?